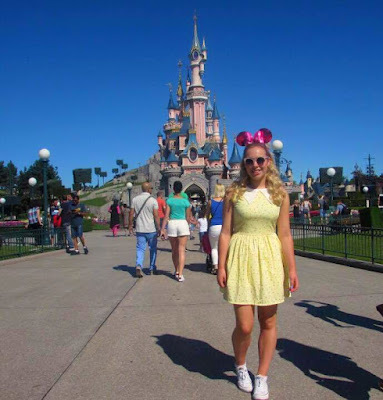 I had been planning my outfits for my trip to Disneyland months beforehand. 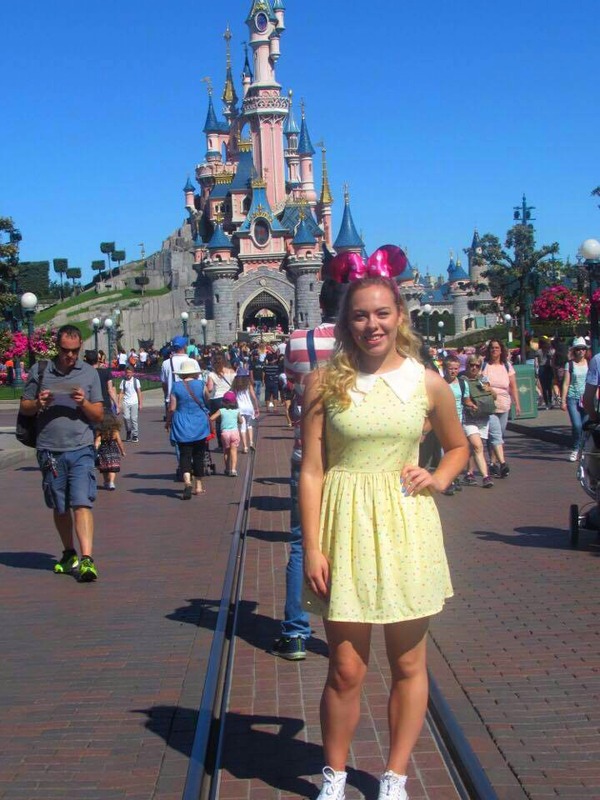 What better place to channel your inner Dis-nerd than The Happiest Place on Earth itself?! I absolutely love DisneyBounding (definition: when Disney fans dress up as contemporary versions of their favorite characters. It's basically closet cosplay at its finest.) 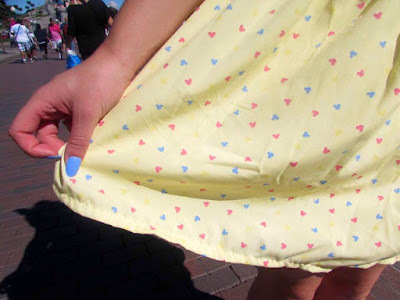 and I sported looks of Minnie Mouse and Cinderella (check out my blog post here). 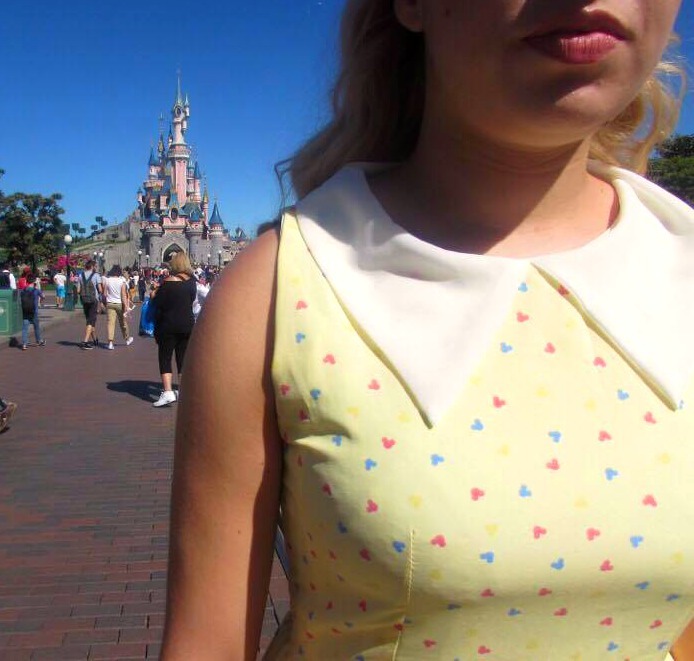 But its also nice to wear some other Disney inspired items too. The lovely team at Bonne Chance Collections got in touch when they heard about my trip to Disneyland and very kindly sent me their new Disney inspired dress! I've been such a fan of Bonne Chance's clothes for a while now. I'm constantly scanning their website to catch any new releases. Honestly, I'm completely obsessed. 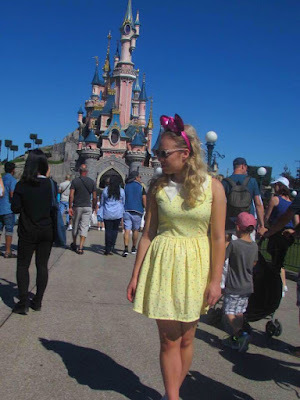 They have such a range of gorgeous dresses and two-pieces with a vintage vibe and the most beautiful, quirky patterns. 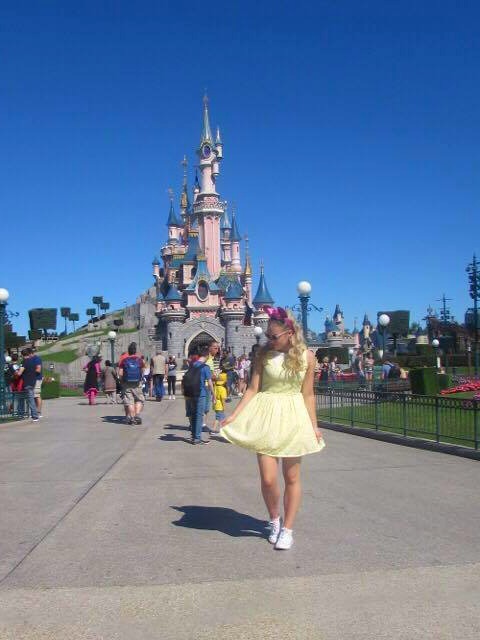 My dress was perfect for the lovely sunny day I spent in Disneyland Paris. I've fallen in love with the pastel yellow mini Mickey Mouse print and its over-sized crisp white collar. The perfect subtle Disney outfit. 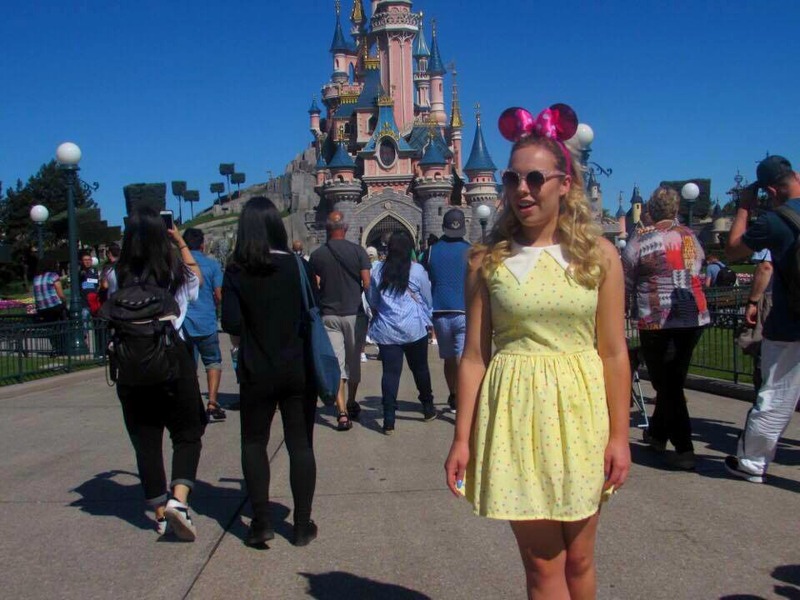 I styled the dress with some white frilly socks, converse shoes, pink cat- eye sunglasses and of course some pink, sparkly Minnie Mouse ears! I am so happy with this outfit! 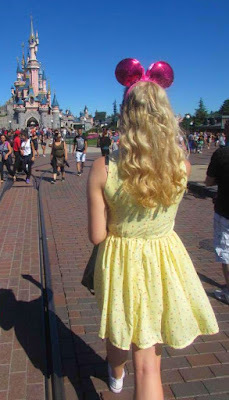 I absolutely loved skipping around the park, releasing my inner- five year old self, dressed in the cutest dress ever. 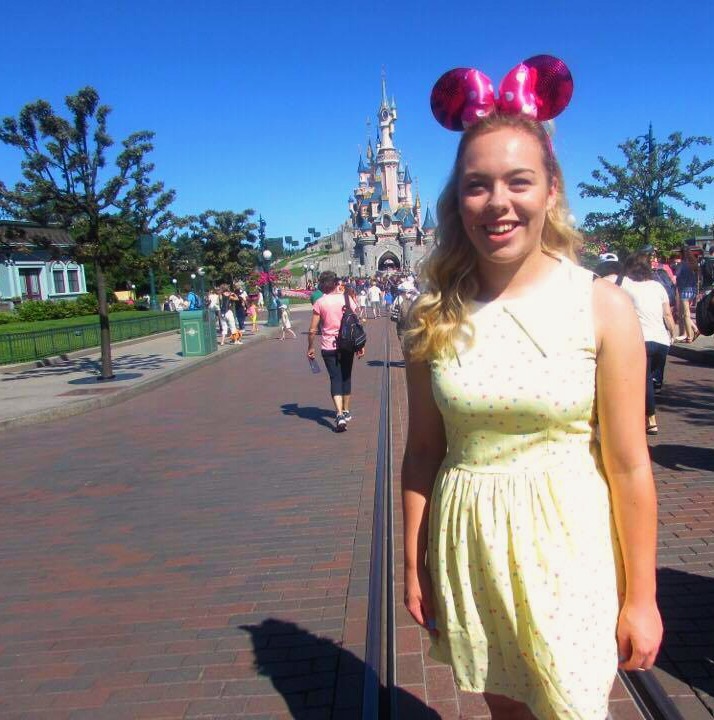 Thanks so much to Bonne Chance Collections for kindly sending me the dress! Also a big thank you to my best friend, Becca, for shooting some photos with me in front of the gorgeous Sleeping Beauty's castle on our trip! Disclaimer: This dress was kindly sent to me by Bonne Chance Collections however all thoughts and opinions are my own.